Discussion in 'RBY OU Seasons' started by ErPeris, Mar 9, 2019. Seeding is done using RBY OU Player Rankings #14. The top 50% of players are assigned seeds using a variation of the pool-shuffling method elucidated by Lutra in [this thread]. Only minimal extensions will be granted in the case that a major real-life event has prevented the match from happening, and under the condition that both players already agreed on a time that lies at most 72 hours past the deadline. This will be strictly enforced throughout the tour. 21. ErPeris 3 vs 0 Niko. I would like to remind everyone that the contact deadline is tomorrow. All those who do not schedule in time will be replaced: not a single day of extension will be given. If you are in contact with other players on discord or on other forums please let me know, just like HML am did. Scheduled with Ika for Friday on Discord. Bedschibaer and Sarah are out. I was luckier and won 3-1 in some quite close games, ggs. Won 2-0 vs Djokra in what was understandably a frustrating series for her as i had perfect matchup in g1 and g2 her lead Egg failed to get a sleep off on my Zam. She then gave me the win, ggs. I'm here to remind you that the deadline is tomorrow. If you have organized yourself on other chats (discord, smogon, etc) please tell me, otherwise i will proceed with the coinflip. I waited on RoA at the scheduled time on Friday, but Ika Ika Musume didn't show. I'm trying to see if we can still get our games done. Activity, no response and I can't play tomorrow. Act to wyc2333, Mister Tim, samy0w and Genesis7. 2 days of extension to Enigami and Ika Ika Musume. 2 days of extension to SamuelBest and Roy. No extension is necessary for me vs Ika, Ika gave me the win because IRL issues. won vs Lusch 3-0 ggs. here is a song because there is no rule that I can't post a song with my winpost and because it came on when I was writing this winpost and I like it. 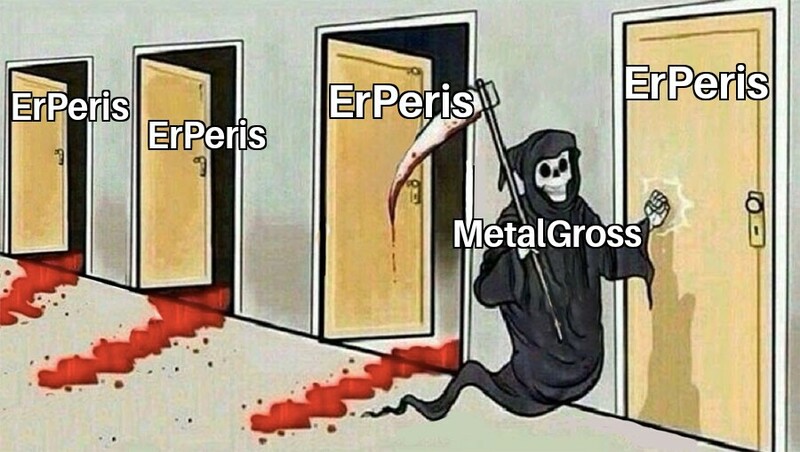 MetalGross and ErPeris like this. I guess they were ggs, apparently like every other set of rby/pokemon nowadays. Well, I'm sorry for wasting our time and not forfeiting the series after the 8th turn of g2, as I didn't feel like playing after that and I was just messing around to be honest. I don't know, it's probably time to find a new way to spend my free time instead of begging the random number generator to do me some favours in a simulation of a pocket monsters game ! 3-0 vs Samy in a streaky series, ggs i guess man. As i already told you before, i don't think you should complain about the games we had 'cause you had your lucky moments too imo, but i understand that this game can be frustrating sometimes. "SToss vs. Recover mons resulting in me FPing until dead/him recovering without issue"
Situations like this one happened exactly the same to me against you in MT #50. I think it happens, it's just the game we play: luck turns once to you, once to me. However this makes me think about how good Ref-Seismic Chansey is right now (well, not only rn, but you all know what i mean). That set was really DOMINANT in the games we have just played. I usually love to change my sets and my mons (in fact i brought 3 different leads, an Eggless team, 2 different Eggs, 2 diffrent 6th, 2 different Tauros and 3 different Lax in only 3 games) but i have never changed my Chansey's set. Last but absolutely not least, GGs, you played well and you really deserve a lot of respect for the way you played against me. I wish you some more luck in the next Tours (well, not against me...). Enigami and Christos like this. ReflectChans is definitely ridiculous, only beaten by a Sing IB Chansey that lands both the sing AND freeze. When a para'd Pokemon that is balanced by being vulnerable to physical attacks beats Selfdestruct Snorlax, Zapdos and fresh Tauros, something's wrong. I'm starting to lean #BanReflect. You played very well yourself, and it might just be salt on my end. Besides a couple key moments our games were otherwise free of hax, so close to being really good games. won 3-1 vs Troller, ggs bro. g1 especially was really wild, i got into a very advantageous situation with luck but then bull went full bull and the game looked over but my own bull blizzard froze it, def worth a watch imo! Enigami, Chrysalis, Disaster Area and 5 others like this. Christos, Troller and HML am like this.